Fiery Enugu based cleric, the Rev. Fr. 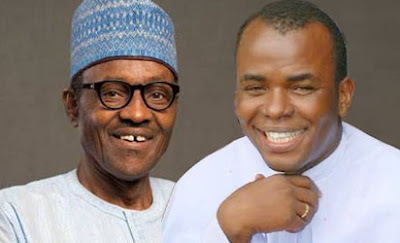 Ejike Mbaka has raised the alarm over the plan by some unnamed persons to kill President Muhammadu Buhari. Mbaka, who is known for his controversial prophecies, is the head of the Adoration Ministry, Enugu Nigeria. DAILY POST recalls that he had in his 2015 New Year message entitled ‘From Goodluck to Badluck’, prophecised that former President Goodluck Jonathan would be roundly defeated in the 2015 presidential elections. On a similar note, the charismatic in his 2016 New Year message, which he delivered before millions of worshipers in Enugu Friday morning raised the alarm over plans to kill Buhari owing to his anti-corruption posture. He equally accused Jonathan of killing Nigeria after which he handed over the skeleton to Buhari’s government. “No matter how malignant the problem is, God says He will be in charge; fellow Nigerians, let us wait upon God; I have a new message; I’m blessing and covering the message we are giving now in the prophetic name of Jesus; Father speak now as your servant listens. “In 2013, there was a prophecy that was going to be an oil doom after several years of oil boom, and when that message came out of this ground, many started calling me a prophet of doom. How can there be oil doom in oil boom? And the oil price continued to climb, but the message said people should start to gather as in the days of Joseph, that the people in government should continue to gather, let them stop squandering our wealth; but they never listened; throughout the six years we passed in the past administration, God blessed our oil with high prices, over N140 per barrel, but the message kept coming, don’t mind the oil boom, there is going to be oil doom, our politicians stop embezzling our wealth but they said the money will continue to come, our oil will continue to flow. “During these moments of the oil boom, there was excess crude money, they didn’t know what to do with our money, when our youths were suffering and still suffering, graduates had no jobs, new industries were not built, our roads were not reconstructed, our hospitals were in shambles and total collapse; our educations systems were in shambles and these politicians were building good schools outside the country, Ghana, etc, even hospitals in South-Africa, and other neighbouring countries and when any of them is sick he will be flown outside the country because there is no hospital in the country worthy of authentic medication, you cannot find any country in Nigeria that has worthy diagnostic facilities; not one; the entire money voted for hospitals were looted out, corruption was in quantum, to the level that the Nigerian Bishops had to convene a prayer against bribery and corruption and enjoined all Catholics to be praying that prayer daily. “All the money voted for roads were swindled; many of them became millionaires, billionaires over night in naira, in dollars, in pounds, in euro when they have no workshop; no business centre; somebody who has nothing doing, just because he is a politician, and they wasted our oil money, now the doom came and there is no preparation for it; the economy of Nigeria is an oil based economy. “My beloved Nigerians, those who led us from last year downwards, they have killed this country; none of them is qualified to stay in this country by now, both the President, the Senators, the Reps, the chairmen of Local governments, the governors, they are wicked; it doesn’t matter the man of God they worship with; I tell you, before God and man, all of them are wicked; they hate this country, they succeeded in removing the liver, kidney and cardio vascular system of this country, and handed over to President Buhari, shambles, skeletal organs of this country; a nation that is comatic. “I am not a sycophant; but I want to tell you that so far God is happy and he who God has blessed none can cause. Many people are planning to kill Buhari; there are many plans on how to eliminate his life so that corruption will continue; so that embezzlement will continue. But I speak to Buhari that God who put you there will protect you; be firm, remain resolute, don’t be intimidated; President Buhari God and his people are behind you, you are the answer to the prayer of His people. “Can you eat your cake and still have it? Our past looters, not leaders, you may not understand, thieves in political positions, have eaten the cake of this country and now everybody is suffering it; the youths are suffering it, they want to tell you that you are marginalized; the Yorubas are not marginalized; the Hausas are not marginalized, Efik people are not marginalized; and it is only you people that are marginalized. In the present political scenario, the Igbos have the position of minister for external affairs in the person of Onyeama; the Igbo people have the position of science and tech in the person of Ogbonnaya Onu; if you go to Abia, you have industry and commerce, coming back to Anambra you have labour and productivity and the problem of our country today is unemployment and once there is job, there will be no kidnapping. The Igbos in the North are doing well; the Igbos in the West too, go to Alaba, they are treated with kindness, why are we engineering things that don’t exist; and like I said before, those saying this have their children abroad and they want to use you. Nigeria is the giant of Africa, Nigeria is the best country in this world; with the best weather; the country that produces the most strongest people; people who can survive everywhere, people who can relate with any type of person, people who can survive any type of weather- Nigerians; people who can prosper anywhere; the destiny, the dynasty, the authority, the destiny, what it takes to make Nigeria great is restored this year. “As I have told you, there is going to be crisis but God will handle it. This year, God said my people will be over-comers, things will be hard but my people will be over-comers”.